Kev has said that he will design the custom stubby cooler to your custom specs, with a design of your choice, and Julian has said he will engrave the logo or words of your choice (as long as it is large enough for the machine to cut). Uber cool! THERE ARE 3 COOLERS UP FOR GRABS AND ONE NUMBER PLATE SURROUND! Yep - 4 winners this month! Kev@VCM is a regular member of ASF and has created loads of amazing mototcycle seats for ASF members. You'll see his work all over the forum. Kev is passionate about his art and it shows in the seats he creates. His skill with leather means he can do custom products, and this stubby cooler will be a prime example of his talent. Wackyrider (Julian) is also a regular member of ASF and has just started using his machine skills to produce custom number plate surrounds for ASF members. You'll see his work popping up over the forum also. Julian is always willing to help with his machining and will create a great custom surround for you as well as other ideas he has in the pipeline! All you have to do is tell us you want it! Post a comment below so we know 'you're in' and then we'll draw the names in this thread from the hat on draw date (listed below). THIS PRIZE WILL BE DRAWN ON 30/10/2012 (longerthan normal - but don't delay!) - So get your post in before then. 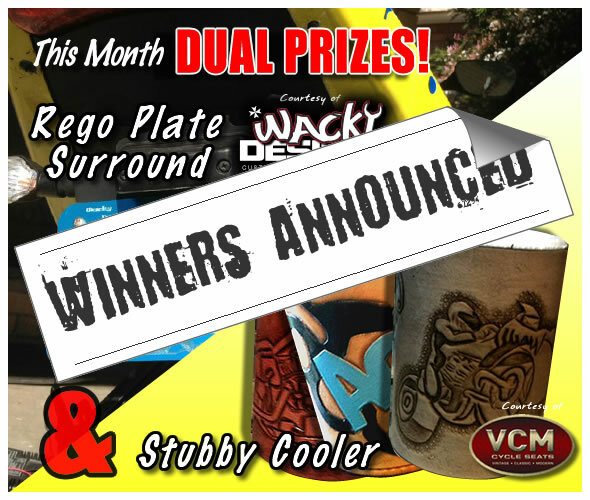 As always I ask you to support our prize donators and check out VCM Cycle Seats and WACKY DESIGNS to view their work. Kev has created some awesome seats for ASF member's bikes and comes highly recommended for anyone looking for a true top shelf job, while Julian is just starting on his own and any support is appreciated. Im in... sadly the plate surround wont fit my bike... or i'de already have one. but the stubby holder will sure fit my beers! I've got to get lucky sooner or later. In. Im In please. I just renewed my membership as it laps 1/2 way through this. I'm in and I want a stubby holder to hold my drink while I'm admiring my custom number plate surround.